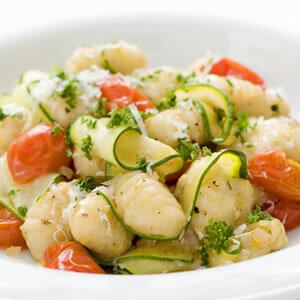 For this recipe, convenient store-bought potato gnocchi are tossed with delicate ribbons of zucchini, shallots and cherry tomatoes that have all been sautéed in nutty browned butter. Meanwhile, melt butter in a large skillet over medium-high heat. Cook until the butter is beginning to brown, about 2 minutes. Add shallots and zucchini and cook, stirring often, until softened, 2 to 3 minutes. Add tomatoes, salt, nutmeg and pepper and continue cooking, stirring often, until the tomatoes are just starting to break down, 1 to 2 minutes. Stir in Parmesan and parsley. Add the gnocchi and toss to coat. Serve immediately. Tip: To make “ribbon-thin” zucchini, slice lengthwise with a vegetable peeler or a mandoline slicer.